Add these spots to your list next time you're in the Windy City. Sure, you could just nosh on a Chicago dog and then go dig to the bottom of a pie at Gino's, but wouldn't you rather eat your way through the Windy City like a local? Or at least like a former local who went on to have exclusive access to the nuclear codes while simultaneously overcoming raging Dad-jeans syndrome without missing a beat? Let Barack Obama's favorite dining picks guide your taste buds through some of the best eats Chicago has to offer. Apparently community organizers love solid diner food—even after they become the leaders of the free world. 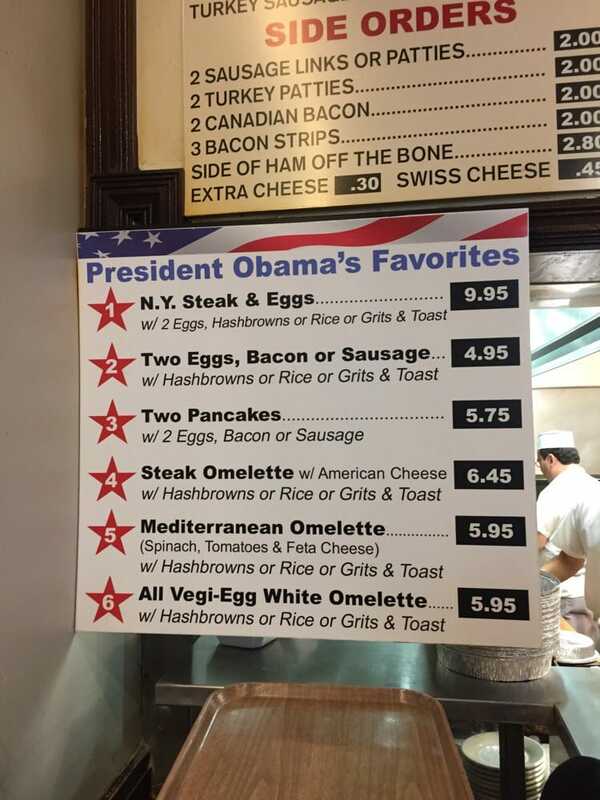 Obama is no exception to that (completely scientific, we swear) rule, dining at the comfort-food-slinging Valois cafeteria from his early days in Chicago to his final days of the presidency. And the former First Eater clearly likes starting his day with a gastronomic bang, as evidenced by his alleged Valois breakfast go-tos. You know how sometimes you crave delicious Mexican food so hard that you make a reservation under a fake name and then show up with your enormous Secret Service entourage? Obama so gets that. It’s not a huge surprise that his love for the innovative takes on old-school Mexican dishes at Rick Bayless’ Topolobampo has inspired some rather unexpected maneuvers. Back when he was a mere senator with a gleam in his eye, Barry ruminated on his love for soul-food joint MacArthur’s in The Audacity of Hope. The legendary spot dishes up timeless classics like meatloaf, collard greens, chicken wings, and mac and cheese—but 44 is especially fond of their turkey legs and dressing. Lettuce share a random fact: The salad bar concept was born in 1970 at R.J. Grunts (and you are very welcome for the pun). So it makes sense that the garden-loving Obamas would gravitate to the casual, family-friendly Windy City staple. Of course, it’s not all unlimited baby corn and cherry tomatoes—they also serve up plenty of juicy burgers to appeal to the ex-Cheeseburger-Fiend-in-Chief. It could be the killer views of Lake Michigan and the Magnificent Mile, or possibly the authentic Italian cuisine and massive wine list, or maybe it’s the nostalgia for the very first eatery they hit up for date night after winning the 2008 presidential election… Something keeps pulling Barack and Michelle back to Spiaggia for special occasions. Of course, it could just be the call of the diver scallop dish that the ex-prez has dubbed a cannot-miss. Nobody freak out, but in the mecca of deep dish, the former First Foodie’s favorite pizza is actually the thin crust and heavy toppings churned out by Italian Fiesta Pizzeria. (Just don’t go blabbing about it to any other Chicagoans.) Michelle turned him on to the spot after going there with her family regularly as a reward for good grades when she was growing up. In fact, the Obamas’ love for the pies runs so deep that the owners were flown out to D.C. to cook up pizzas for the inauguration. With great power comes unlimited delivery zones, apparently.